I’m Carma. I’ve been married for 27 years, since shortly after my 20th birthday. 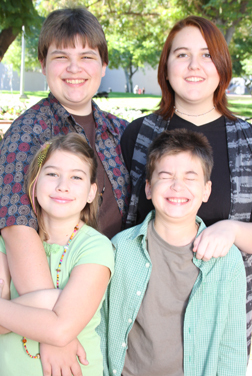 We waited ten years to have kids, so right now they are 16, 14, 10, and 8, girl-boy-boy-girl. I blog about life, liberty, and the pursuit of learning at Winging It and I also design t-shirts for homeschoolers, Christians, and just for fun. It’s either “full go” or “full stop” around here! We are very active in things the kids want to do outside the home such as a homeschool theater group (Shakespeare in the fall, a lighter play in the spring), music classes (different for all four kids, of course! ), co-ops with friends, homeschool group park days, attending lots of plays, and so many other things – we’re out of the house almost every day! Then when we’re at home, we all tend to crash and sit in front of computers or read or do other quiet, separate pursuits. In a single word: Life. In a few extra words: Unschooling means living without a formal schedule of academics, but I don’t like thinking or living in negative terms, so I look for the positive reflection of that. Really, unschooling is about living the normal life you live, with your children alongside so that they can learn about living life directly from you and can begin living their own lives now rather than preparing to live sometime in the future. Um, honestly, I’m not sure how to answer that. I don’t think I’m someone who has a lot of expectations for other people and I’ve always looked at my children with a sense of anticipation, curious to see how they will turn out, to see what kind of children God gave to me. I’ve always known the possibilities were limitless so it’s kind of like opening an exciting package on your birthday: whatever it is, you know it’s going to be a lovely surprise. I’m pleased they are all interested in theater because I loved that in school and it gives me a chance to get back behind the scenes myself. I love that they are all musical and each has chosen an instrument that is so clearly a personal expression. 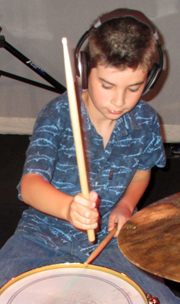 When my younger son wanted to learn drums that surprised me a little – it isn’t an instrument I’ve been much exposed to so I never really showed it to my kids – but as soon as I saw him practicing I realized what a perfect fit it is for his personality and now that interest seems so inevitable to me. 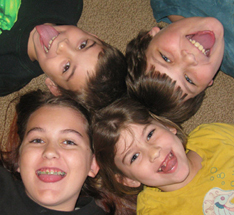 What are some of the benefits of unschooling you have seen? Where do I start? And how much time do I have? 🙂 I have one kid who could not read until age nine, who would have been bottom of the barrel in academics in school. He would almost certainly have the reading difficulties associated with dyslexia if forced to read “on time” but instead he is a fluent reader who actually loves to read. I have a kid who is a social butterfly and in school would likely do anything to fit in with the “in” crowd who is instead growing up very comfortable being who she is. I have one with Asperger syndrome who has a passion, as these kids often do. For her it is art; unschooling has given her the time to become an accomplished artist already. She has several friends on the autism spectrum, who were in school at least for a while when they were younger, and when I see the issues that forced association with large groups caused for these kids, who are all at the far end of the introvert spectrum and must have alone time or they break down, it makes me so grateful to have kept her at home and given her the alone time she needs. Also, I’m an introvert and I need a lot of down time myself, so there are plenty of times when I’d rather tune my kids out and curl up with a book than strew interesting things in their paths or help them explore their interests! Of course we all do a lot of curling up, but my little social butterfly extrovert, my youngest, often needs more from me than I feel equipped with. Fortunately we have a large circle of friends and arranging playdates for her isn’t too much of a hassle – I just wish they all lived on the same block with us! I recently came across a snippet from a song, “Burn and Shine” by The Elms, a band I had never heard of before. And the lyrics of the song say, “Life is all your moments in a row.” And I love that thought, and to me that is unschooling. Live your life now, because the clock is already ticking. Thank you Carma for this Unschooling Portrait! Next Next post: How Do Unschoolers Learn Math?